Members of the new Adventure Club enjoy discounted tickets and other benefits at The Adventure Park. Adventure Club Members simply pay an annual membership fee, then at any time during the next 365 days may reserve tickets to climb during regular Park hours for a discounted flat rate of $29. Savings are greatest for adults but any age eligible for climbing tickets may become a member. All members receive a membership card, which must be presented upon arrival at the Park before climbing. Memberships now will be good for discounts and benefits through this time next year. Members can join when visiting The Adventure Park or online. To see membership benefits and terms and conditions and to join visit here. Tickets to The Adventure Park during regularly scheduled operating hours for $29. The Adventure Club membership is active for a full year (365 days) from date of purchase. 10% discount off all store items when presenting their membership card. Bring a guest and they will receive 10% off their General Admission ticket. 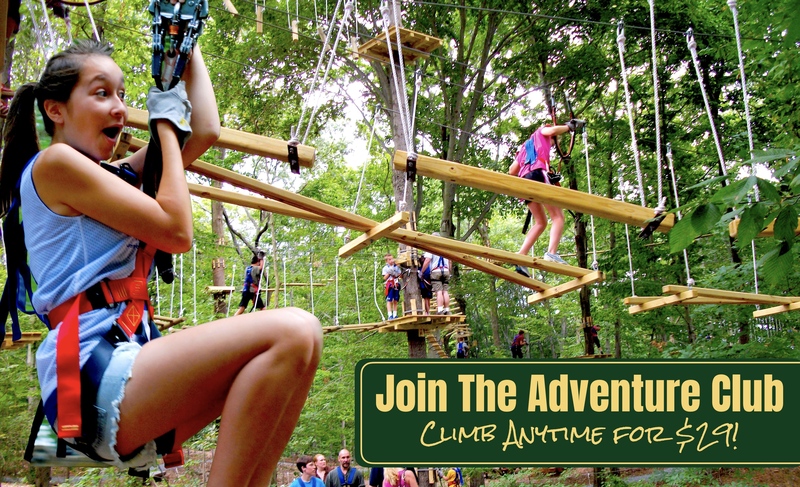 Club membership honored at SEVEN Adventure Parks nationally (see Park locations at FunInTheTrees.com). "We know many of our climbers want to return to The Adventure Park for multiple visits and we hope the new Adventure Club membership will help more of them to do so," said Adventure Park president, Bahman Azarm, "The affordable price should enable more people, their friends and families to climb together more often." The Adventure Park at Long Island is designed, built and operated by Outdoor Ventures in cooperation with Henry Kaufmann Campgrounds. It is located at 75 Colonial Springs Road, Wheatley Heights, NY 11798. Hours and pricing click here. For further details and updates visit www.LongIslandTrees.org, email Info@LongIslandTrees.org or call (631) 983-3844.